The National Neigong Research Society (NNRS) and Chen Qingzhou Martial Arts Association, USA is pleased to announce the planned Spring/Summer 2001 visit of Chen Youqiang, Assistant Chief Instructor of the Chen Qingzhou Martial Arts Association, USA and fifth son of Grandmaster Chen Qingzhou to the United States. His visit is scheduled (visa pending) for May 2001. 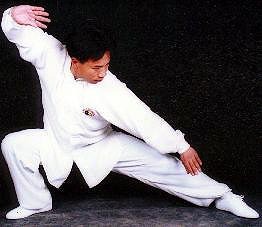 Chen Youqiang demonstrating "Cannon Fist" set. 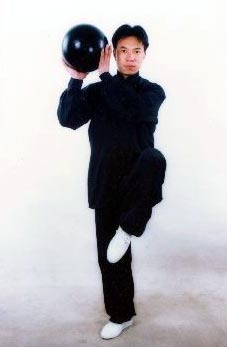 Chen Youqiang demonstrating Taiji sphere set. Chen Youqiang, was the coach for the NNRS team at the 6th International Taijiquan Conference held in Wenxian County, PRC. As a child, he studied traditional Chen Family Taijiquan (Lao Jia) with his father, Chen Qingzhou. At the age of 16, he began accompanying and assisting his father on his Chen Family Taijiquan teaching appointments to various places in China. 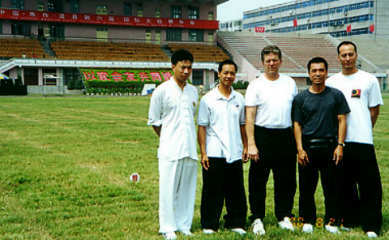 They have taught Chen Family Taijiquan to students in Nanjing, Xuzhou, Baoying, Xinxiang, etc. Chen Youqiang's Chen Family Taiji techniques encompass push hands, Lao Jia first and second forms, spear, dao, sword, staff, and Taiji sphere. Chen Youqiang was the Taijiquan push hands champion of Henan Province for four years from 1988 through 1991. There will be classes and workshops in the San Francisco Bay Area and throughout the country. According to people who came back from China, Chen Youqiang is very good with the "Cannon Fist" form and push hands... While details are to be finalized, workshops, a camp, and a weekly class in the San Francisco Bay Area focusing on the "Pao Chui" (cannon fist) form are being scheduled by the NNRS. People who had completed the Lao Jia Chen Taiji first routine (Yi Lu) may register for the "Pao Chui" class. Check this site for updates. Suggestions for classes or workshops are welcome.